21 cm 177 p. : ill. In an age of me-too products and instant communications, keeping up with the competition is not a winning strategy. Today, you have to out-position, out-maneuver, and out-design the competition. The new rule? When everybody zigs, zag. In his recent bestseller, "The Brand Gap", Neumeier showed companies how to bridge the distance between business strategy and design. 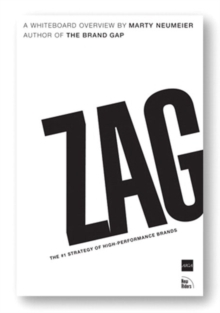 In "Zag", he illustrates the first discipline for building a high-performance brand-radical differentiation. Praise for "The Brand Gap": "The surprise book of the year!" - John Moore, Fast Company. "A pleasure to read" - David Aaker, author of "Building Strong Brands". "The first book on brand that seems fresh and relevant." - Ric Grefe, executive director, AIGA, the professional association of design. "Must-reading for anyone who wants to understand how their business strategy will succeed or fail." - Steve Harrington, director of strategy, Hewlett-Packard. "Read this book before your competititors do!" - Tom Kelley, author of "The Ten Faces of Innovation".